Panasonic HDC-SD700 is one of the new selection of ‘Full’ High Definition (HD) 3x MOS memory card camcorders. It houses a 12 x optical image stabilised zoom lens, a 1920 x 1080/ 50p processor (2 x greater detail compared to 1080i models) and a large, high quality 3.0″ LCD. The camcorder also has the ability to record still images of upto 14 megapixels. Fully featured with OIS image stabilisation Full HD in a compact video Camcorder. Final Cut Pro X, the latest version of video-editing software geared for professionals from a company increasingly focused on mainstream consumers. Final Cut Pro X is a follow-up to Final Cut Pro X, software Apple released in 2009 as part of Final Cut Studio. Like Apple’s newly released of Mac OS X Lion, Final Cut Pro X was only be available to customers through the Mac App Store. However, this new released FCP X does not support well with Panasonic HDC-SD700 1080 60p/50p AVCHD Videos. So if you want to edit SD700 1080 60p/50p 28Mbps in Final Cut Pro X, you are recommended to use Panasonic Video Converter for Mac, which is the superior Mac Panasonic 60p/50p MTS to FCP X converter for Mountain Lion, Lion or Snow Leopard. It does not only convert Panasonic 1080 60p/50p AVCHD to Prores 422 MOV or H.264 MOV on Mac, but also merges 1080 60p/50p MTS files for import into Final Cut Pro X. 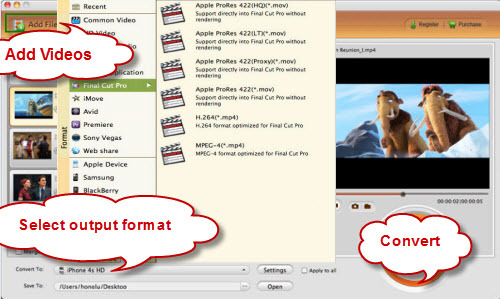 Here is the step-by-step guide for you to import and edit Panasonic HDC-SD700 60p/50p MTS to Prores 422 MOV or H.264 MOV for Final Cut Pro X on iMac/MacBook Pro with Mac OS X like Mountain Lion, Lion, Snow Leopard, Leopard, Tiger. 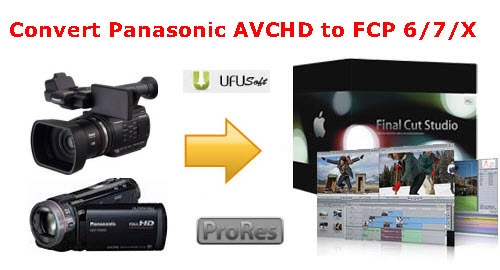 After transferring .mts files from Panasonic HDC-SD700 camera, run UFUSoft AVCHD Converter for Mac as the best Mac 1080 60p/50p MTS to ProRes MOV converter, and click the “Add File” button to load .mts videos. Select all the files and then click “Merge”, and the Panasonic HDC-SD700 1080 60p/50p MTS converter will join and combine the video clips into a single file as output.